Tim Irwin's movie reviews, ranging from the obscure and inane to the recently released. Over the years I’ve seen American westerns, Italian westerns (generally the best), Japanese westerns (both new and old, though the old ones are usually samurai movies), and even some Mexican/Spanish westerns . I believe, though, that this is the first German western I’ve seen. To top it off, it was made in 1970, is ridiculously gritty, and happens to be rather fantastic at the same time. Some might argue that it’s not a true western. It’s set in the mid 1900’s, probably, but Western themes and some other important Western elements are present. 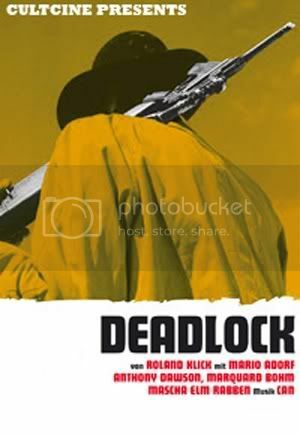 No Country for Old Men is a Western in a way, and so is Roland Klick’s Deadlock. There are vast landscapes, often one of the most important aspects of the Western. Filmed in Israel, the setting is amazing. It is barren and strewn with rocks, and quite uninviting. The characters could have been ripped from a number of Westerns, American or Italian. Low lives, dirty and grimy, often caught in cool poses with their guns. Then there’s Mr. Sunshine, basically Clint Eastwood in German form. Deadlock’s story revolves around the Kid (Marquard Bohm), who stumbles through the desert with a machine gun and a metal suitcase. He has been wounded and is about to die when the crotchety and eccentric Charles Dump (Mario Adorf) drives past. Dump stops, checks out the money in the case, and thinks about bashing in the kid’s head. Instead he takes him back to his place, which used to be an oasis in the desert, filled with whores and gambling. A paradise, practically. There was no chance the filmmakers could have created such a thriving scene, however, since there are only seven people in the entire film. It turns out that the Kid is waiting for Mr. Sunshine (played by a Scotsmen, Anthony Dawson) to show up. The two of them hit a bank or something and escaped with the money. Dump, who’s rather crude, clumsy, and a bit mean spirited, attempts to abscond with the cash. Unfortunately for him, he is the least cool character, as both Mr. Sunshine and the Kid far surpass him, meaning that his attempt to grab the money will fail. Mr. Sunshine is cool and cruel, while the Kid is cool in a more juvenile manner. Dump, however, is a loser, living in a dead oasis with an old former prostitute and their nymphomaniac daughter, who appears to be in her teens. The two women have little to do with the plot, but add interesting depth to the atmosphere and the setting. The plot is familiar, boiling down to three characters fighting both physically and mentally for the loot. Deadlock borrows heavily from Sergio Leone’s Westerns, but that’s not a problem. It is odd enough and strange enough to stand on its own. It has the necessary dirt, grime, and greed from films like The Treasure of the Sierra Madre to create a believable Western atmosphere. The film is also rather violent at times, though it doesn’t veer into exploitation territory. A number of different audiences might be interested in Deadlock. It is a rare film, and a German Western. The atmosphere and setting are credible and unique, though the characters and story are somewhat conventional. The entire experience is engaging and different, and something that Western fans might be interested in exploring. I enjoyed the strange characters and the bizarre behavior, all wrapped in a Western shell, and those interested in odd movies should be sure to search out Deadlock. This entry was posted in 3 pirate flags, 3 stars, D, Movie Reviews, Pirate Flag Rating, Star Rating on February 12, 2010 by Tim Irwin.